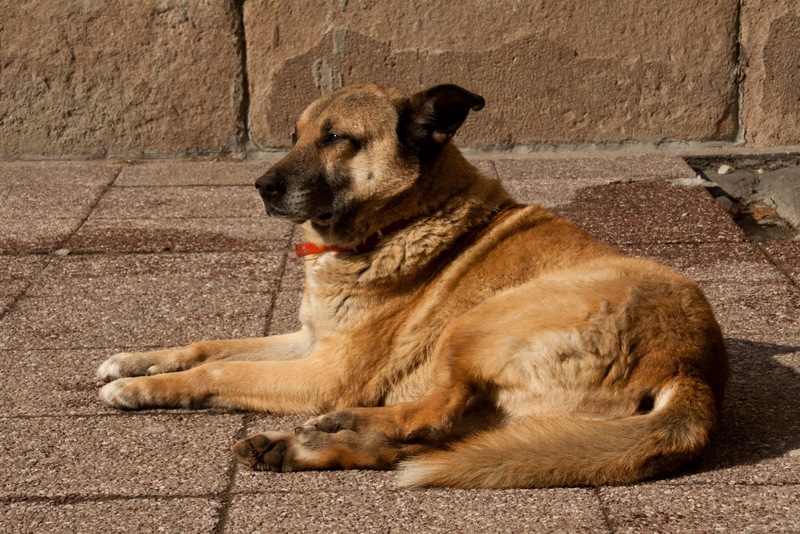 Like most of Eastern Europe and many Western European cities, Bulgaria has many stray dogs and cats living side by side with its citizens. I expected them in Sofia, but they live in Bansko, too. 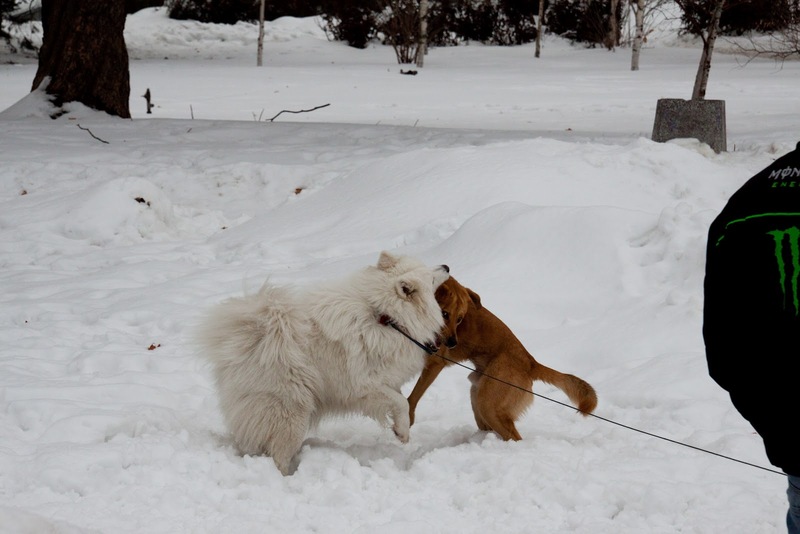 These two dogs were in rare dry spots, out of the snow. They lounged in a courtyard behind TZUM, Sofia's large department store. We saw this dog in a park whilst on our city tour. 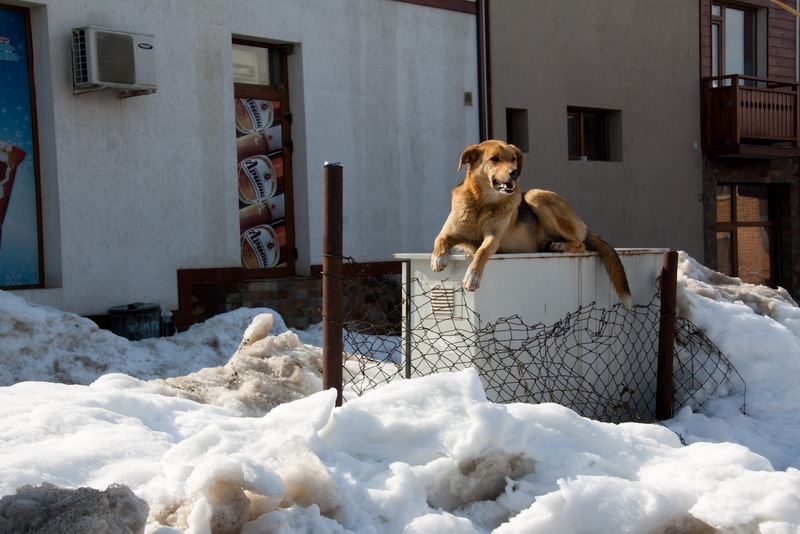 I asked the guide if the dog was special, since he had a doghouse- the guide didn't know anything about him, but said he was surprised to see a doghouse, since most of the strays were disregarded. This was a stray who followed this pet dog around on a walk in Borisova gradina, and they occasionally engaged in play wrestling. 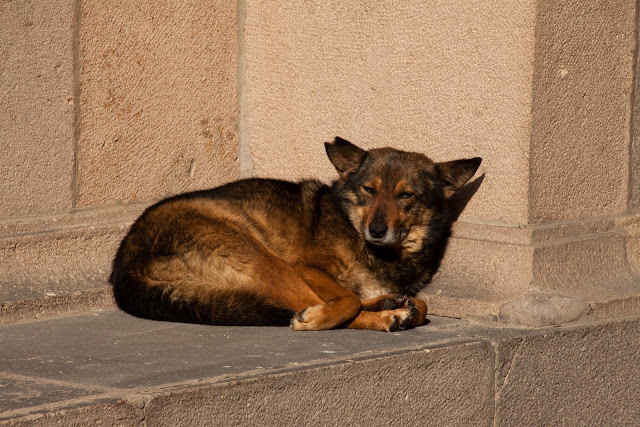 I commented to Paul that I would have a hard time leaving a dog out in the streets (at all!) if he so obviously got along with my dog. 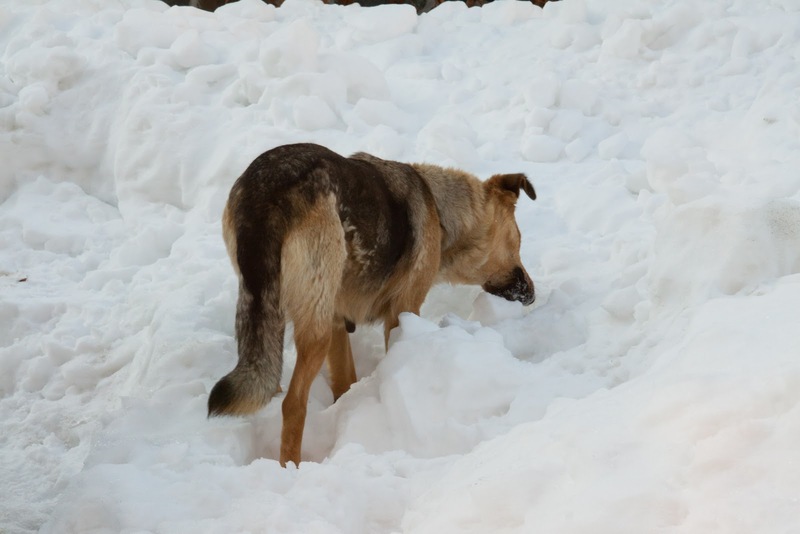 I wondered many times, as we watched these dogs clamber through armpit-deep snow, what they'd done the previous couple of weeks, when the temperature was nearly -20º C. We saw many homeless people sleeping their days away in the churches, tucked in a back pew, but the dogs and cats had no refuge that I knew of. It made me wonder how many of the large snow banks were acting as coffins until the sun melted them away, uncovering the hard winter's victims. 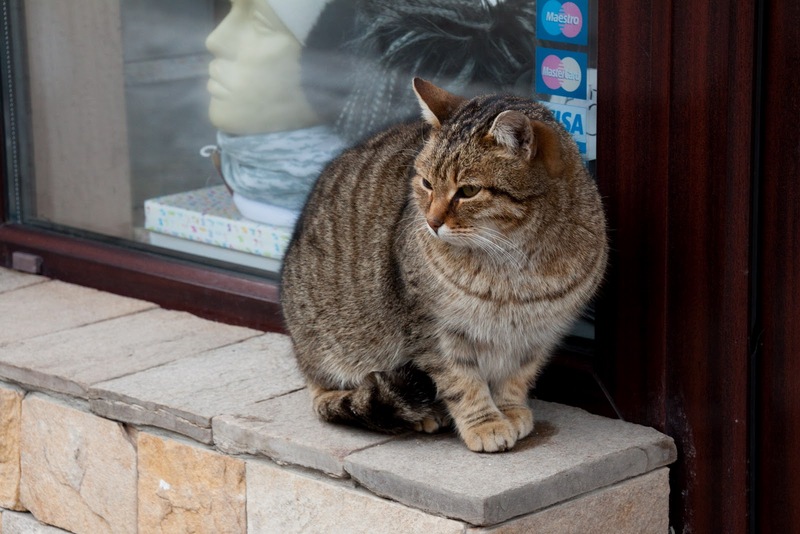 A cat outside a shop in Bansko. 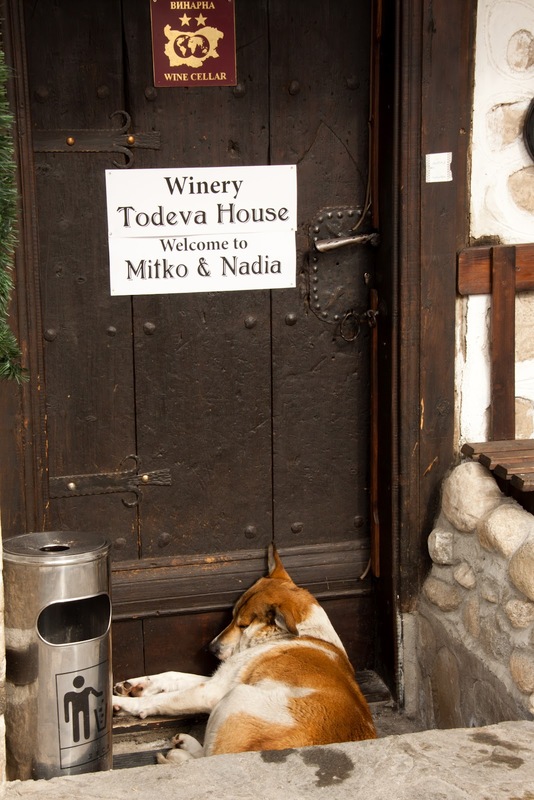 I saw this dog a couple of times in Bansko. He lived on the main street, and was usually near this vacant lot. With this portly belly I'm guessing he gets a few leftover scraps from this restaurant! Our resort had a few dogs that lived on the property (still as strays). 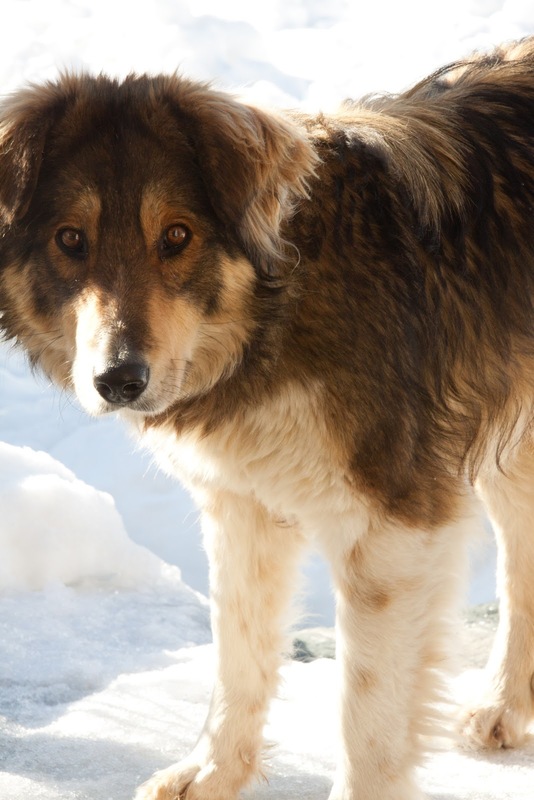 There was this female, two other dogs I am pretty sure were both males, and a longer haired dog who I only saw up near the road. I had mixed feelings about feeding them; on one hand it encourages their begging and scavenging, but on the other hand, where else will they get food? 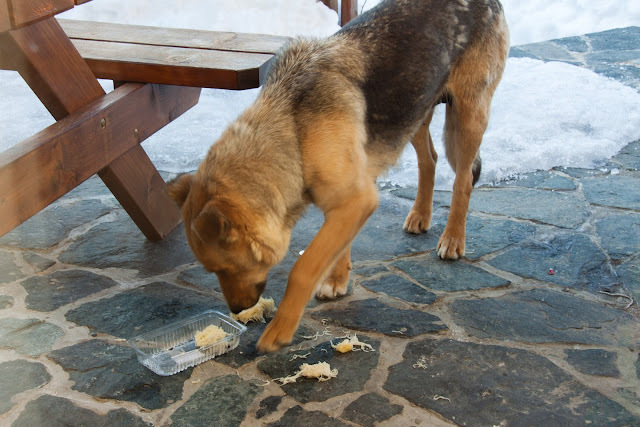 Our food was going to waste otherwise, and clearly the dogs were fed by previous guests, so I gave in to my impulses. This female came by a few times, and I would set our leftovers/scraps down around the corner for her. Our last morning I cooked up the eggs, noodles, and anything else we had left to feed to her. She gladly ate them up. 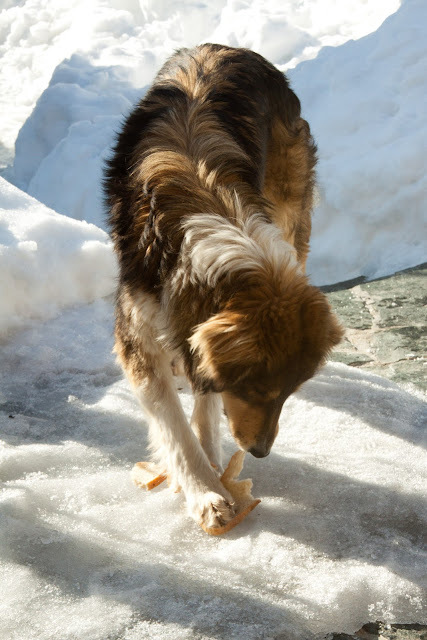 She didn't finish all the noodle nests, and buried a couple in the snow- smart girl, to save some for later. After a while, this one came over- this was the dog I'd only previously seen near the road. She'd not ventured down as far as our chalet (at least when we were there), and was incredibly skittish whenever I opened the door. I scrounged around, trying to find her some snacks, as I'd given most of what we had to the previous girl. I tried a pear (Max loves them), but she declined. I had some bread left, so she got that, as well as some yogurt. Some previous tenants left some puffed rice cereal, so I soaked that in the milk we had left and she gobbled that up. I was heartbroken over her, as she was clearly the lowest in the pecking order of our resort dogs, and seemed young. I'm pretty sure if I'd had more time she'd be living with us now. She worked her way into my heart in less than one hour. I hope other guests are kind to her, and the other dogs.